Growing your own. For remnant vegetation where mistletoe has become locally extinct, or disturbed areas being rehabilitated and revegetated with indigenous plants, mistletoe can make a useful addition to many restoration efforts. With increasing reliance on plantation grown trees for commercial timber production, mistletoe could also be introduced into these artificial habitats, providing a range of resources for the otherwise displaced fauna. 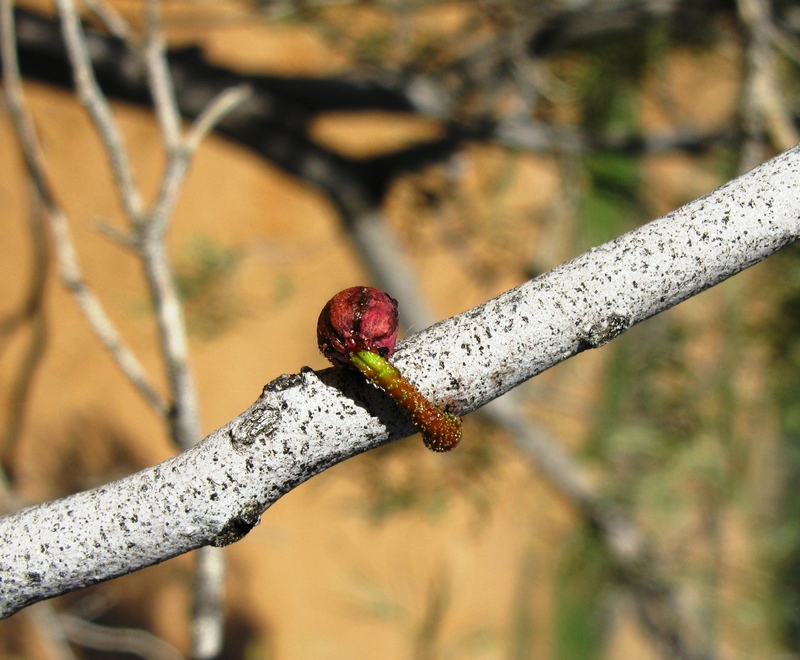 By paying careful attention to known host ranges of local mistletoes and introducing selected trees to act as hosts within the plantation (e.g., acacias within a eucalypt plantation), the commercial trees will remain uninfected. In combination with installation of nest boxes and other strategic resources, the addition of mistletoe to plantations could actually improve tree growth and timber yields through the greater numbers of insectivorous birds and bats. With their colourful blooms, extended flowering seasons and distinctive foliage, mistletoes make great additions to gardens, with the array of visiting butterflies and birds adding to their appeal. The first step is to make sure you have a suitable host tree. While native trees are generally best, some mistletoes are just as happy on fruit trees, willows and other exotics. Small or young trees should be avoided—the addition of a mistletoe may represent too great a strain and could shorten the tree’s life. Once you have a likely host or two, next step is to gather some seed. Scout around your local area and see what’s growing (this will also help you to decide on a likely host). The fruit needs to be ripe and soft to the touch, otherwise the seed will not be fully formed. Although germination success is typically very high, the establishment of mistletoes is generally low, so if you want two or three mistletoe plants, gather at least thirty fruit—you can always prune off any unwanted clumps later on. Take the entire fruit carefully from the mistletoe and, as soon as you can (within a day or two, no longer) remove the seeds and wipe them on a branch. Remove as much of the pulp as you can and wipe the seed on the underside of a well lit branch—this will allow more dew to accumulate and increases the chances of establishment. The branch should be no thicker than a pencil and don’t place the seed too far along a branch, otherwise the clump is liable to break off as it grows. Then step back, cross your fingers and wait a few months. The seeds should all germinate but, depending on the tree, the branch, the weather and the vagaries of nature, only a few will establish. If there are lots of possums around (especially brush-tailed, but also the smaller ringtails), you may have some difficulty in getting plants to establish, with any new growth being nipped off at night. Try using an isolated tree as a host—possums are less likely to dare crossing the open space. If all goes to plan, within a year or two, you’ll have your very own mistletoe! As well as gardens, this approach can be scaled up for habitat restoration in areas where the original bushland has been cleared. In this situation, as with all revegetation, pay particular attention to provenance and try to obtain seed from the nearest available source. 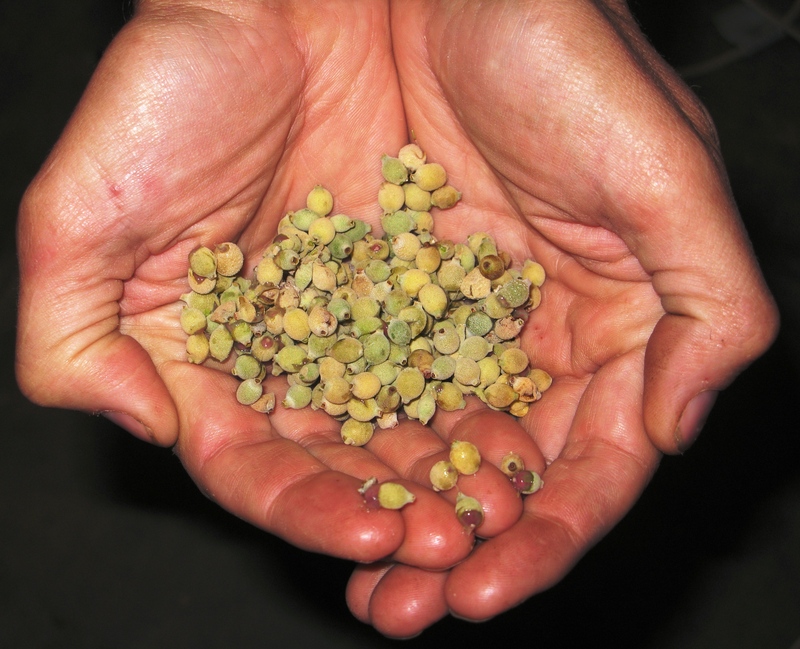 Handful of freshly harvested pale-leaved mistletoe fruit, to be used for germination experiments.